It’s been a long and hot summer on the farm in Leicester, N.C. June was uncharacteristically sweltering and dry, and by the beginning of July the grasses were losing their green and suffering in the heat. Thankfully, the rains came in mid-July and though we did have a few terrifyingly impressive thunderstorms that took out a few trees and flooded the creek, the majority of the rain fell in the afternoons as the steady, warm soaking that the fields desperately needed. Now at the end of September, the grass is tall and bright green and healthy and the animals are well fed and content. The nights are cooling down and finally the afternoon sun doesn’t beat as hot on your shoulders. 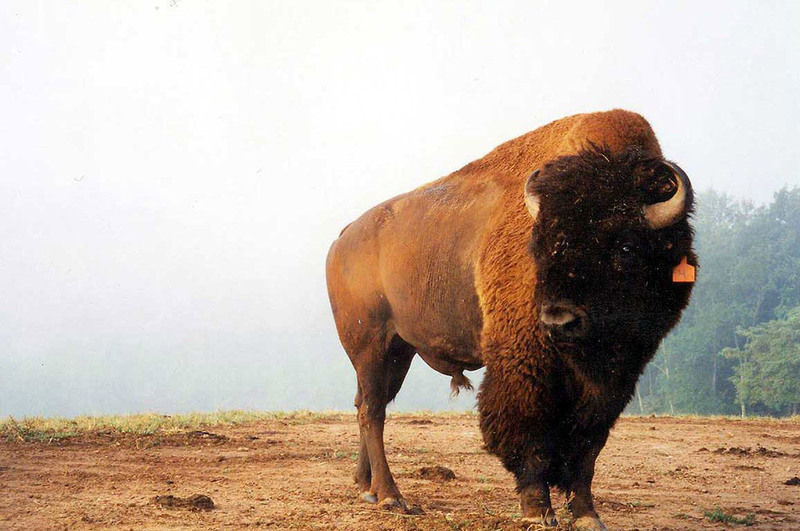 Everyone can feel the shift in the weather and the bison have been more energetic and playful in the past week. Belle, the bi-tusi (part bison, part Watusi) comes running up to the tour trailer in the mornings now and leaps into the air kicking her feet like a calf in the spring. She even got a few older cows to join in with her and they ran along with the tractor jostling each other in a game that made the people on the tour laugh at their antics and take tons of pictures. To see silly behavior from such dignified animals was new to them, and I explained that we all get a bit giddy as summer winds down and the heat relaxes its grip. The rut will start soon. Tiny and the Twins are starting to court the cows, staying close by the ones they like and leaning in to catch their scents, all the while keeping their eyes on each other warily. The fighting hasn’t yet begun but they circle each other like boxers, sizing each other up and taking notes. Where earlier in the summer they would happily stand next to one another at the tour trailer waiting for guests to throw out handfuls of range cubes for them to crunch on, they now stand on separate sides, always careful to keep the tractor between them and never getting too close to each other. In a few weeks the drive of the rut will cause them to bellow at each other, roaring like lions, and they will collide in a fury of dust and hooves and power to see who is really the biggest and most worthy of the bulls. When the rut is over it will be quiet again and the herd will contentedly eat the fall grasses as the leaves begin to change and the light slants golden across the mountains. For now, though, we still enjoy the warmth of the late summer sun and the songs of the cicadas in the trees as the spring calves grow strong in the fields of Dr. King’s Farm.